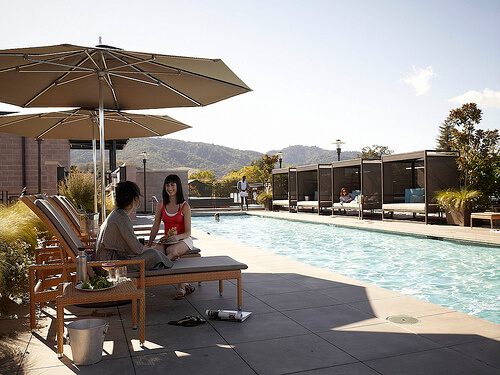 Bardessono’s 75-foot rooftop pool offers views of the Mayacamas Mountains and Stags Leap district. If Kermit the Frog had his way, he’d probably hang out on a lily pad in Napa Valley. Kermit may not think it’s easy being green and he’s certainly not LEED Platinum certified, but he shares some of the same values as Bardessono Hotel, Restaurant and Spa in Yountville, California. Bardessono is considered one of the greenest luxury hotels in the world. The property opened in February 2009 in a challenging market. 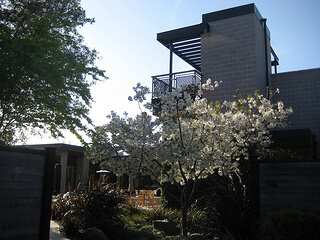 In 2012 they have emerged as a hotel leader in the Napa Valley due to their commitment to the hotel’s design, construction and operation in Leadership in Energy and Environmental Design (LEED) Green Building Rating System.™ It’s safe to say that Bardessono is one of the most sought after hotel destinations in Napa Valley wine country. This room is a like a Russian nesting doll in that there is a spa within a suite. The bathroom is cleverly designed to double as a private spa, complete with a soaking tub, separate shower and hidden massage table. Bardessono’s philosophy, “personalized spa treatments should be enjoyed in the special seclusion of each room.” Who am I to argue with that? And, taking my job as a lodging editor ever so seriously, I experienced the Bardessono Massage, 60 minutes for $150. and am happy to report to you that personalized spa treatments are, indeed, the way to launch, or wind down, a stellar wine country weekend experience. There is also a gas fireplace and 40-inch television in each 550 square foot room, as well as a private balcony or courtyard attached to each suite. My room, #309, rented for $599. per night during high season. Check the website for package deals with added amenities. In my travels I have noticed that luxury properties have upped their fitness game, not only with onsite fitness centers or access to gym’s within walking distance via hotel partnerships , some offer gym clothing and running shoes on loan during your stay or yoga and pilates classes. Bardessono offers a Saturday morning yoga class and Monday evening class – complimentary for hotel guests, $8 for non-guests. The property also offers complimentary bicycles and a Lexus Hybrid for use, as well as Friday evening complimentary wine tasting in the bar from 5:30-6:30 p.m. Valet parking and internet access are included at no additional charge. While the property is pet-friendly, I suggest you leave Fido at home unless you don’t mind dropping $125. on the one-time cleaning fee. Lucy Restaurant & Bar recently re-opened in 2012 at Bardessono, bringing more natural light into the dining and bar areas. The restaurant’s name pays tribute to Lucy Bardessono, the matriarch of an Italian family that immigrated to Yountville, California in 1928 and established a working farmstead on the property , now home to the hotel. While there are plenty of Michelin star restaurants in the area, we enjoyed breakfast at Lucy Restaurant. The Croque Madame, with its house-cured ham, gruyére cheese, fried egg and mornay sauce resting on a bed of mesclun greens was delicious. To celebrate Earth Day and in an effort to protect the open-space of Napa Valley – Bardessono is offering the Hike the Day Away package. This includes two annual memberships to the Napa Valley Land Trust and overnight accommodations in a luxury King Spa suite. The Napa Valley Land Trust is a community-based, non-profit dedicated to preserving the character of Napa by permanently protecting its land. In addition to supporting this organization, the membership includes hiking access to land not accessible to the general public. The 62 room Bardessono is a model for contemporary environmental design with a sense of place and history. Designed by Phil Sherburne, Bardessono makes being green easy. Everything from heating and cooling systems and lighting to water use and native landscapes have been taken into consideration; along with organic bedding, cleaning supplies, creek-side protection and locally grown food. For additional insider tips follow Luxury Travel Writer Nancy D. Brown on Twitter and follow Bardessono Hotel on Twitter. Bardessono Hotel (877) 932-5333 or check rates online. Article written by Travel Writer Nancy D. Brown of What a Trip, Travels from Northern California. Pool photo courtesy of Bardessono. Hotel photo courtesy of Nancy D. Brown. I was a guest of Bardessono.